The Ara Project, Asociacion Copan & Macaw Mountain, Bird Conservation Nepal (BCN), Belize Bird Rescue, Conservation and Rehabilitation of the Habitat (CONREHABIT), Echo Bonaire, HARI (Hagen Avicultural Research Institute), Fundación Ecológica Rescate Jambelí, Last Great Ape Organization (LAGA), Limbe Wildlife Centre (LWC), Lwiro Primate Sanctuary, ProFauna Indonesia, SOS Fauna, R3 Animal Rescue, Visakha Society for Protection and Care of Animals (VSPCA), Natural Encounters Conservation Fund (NECF), Paradise Park, Pro Wildlife, Royal Society for the Prevention of Cruelty to Animals (RSPCA), Humane Society of the United States (HSUS), Calgary Parrot Club, NOAH Nature Alliance, Folke H. Peterson Foundation, Bill and Terry Pelster, Albertino Abela, Macaw Landing Foundation, Keith Ewart Charitable Trust, Isdell Family Foundation, American Federation of Aviculture, Shared Earth Foundation, the Bungee Foundation and the Parrot Fund USA. The wildlife trade has affected many bird species around the globe and has caused the suffering and loss of hundreds of thousands of parrots in particular. 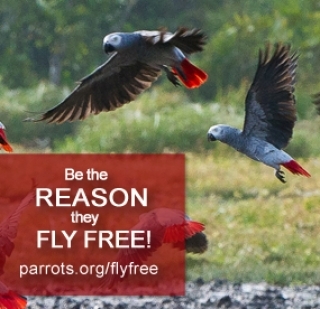 In response to the urgent need for action the World Parrot Trust launched the FlyFree campaign in 2009, highlighting the destructive practice of capturing wild birds for the pet trade and gaining worldwide support to end it. The focus has been on three types of direct action: enforcing wildlife laws, confiscating parrots from traders, and releasing birds back to the wild. Progress and outcomes: FlyFree is helping to rescue, rehabilitate and release birds, supporting reintroductions, aiding confiscations, enforcing laws that protect parrots, backing global awareness programmes and funding research into better understanding the trade region by region. Focus of future work: Thanks to the work spearheaded by the WPT in the EU, much international trade has now been shut down, but countries in Asia and the Middle East are still actively importing wild caught birds. In places where parrots occur naturally, trapping continues to supply this demand as well as the domestic pet trade. To that end, WPT is working on halting exports from the few remaining countries in Africa, Asia, Central and South America is the final hurdle in ending the trade in wild parrots permanently. WPT's FlyFree supports the front-line efforts of dozens of partner agencies in India, Indonesia, Nepal, Cameroon, Kenya, the Democratic Republic of the Congo, South Africa, Mexico, Guatemala, Honduras, Belize, Costa Rica and Brazil -- all committed to ending the wild bird trade. We provide logistical and operating support for these groups and their efforts to attend to the needs of parrots confiscated from traders. Congo - In addition to working with the Lwiro Sanctuary with the Congo 500 WPT has initiated surveys of bais (forest clearings) in the Democratic Republic of Congo (DRC) to better understand how they are used by African Grey parrots (Psittacus erithacus) and how much local trapping is occurring. Cameroon - WPT assisted with the confiscation, rehabilitation and eventual release of 1500+ African Grey Parrots taken in by the Limbe Wildlife Centre over just a few months. Emergency funds and logistical guidance were immediately dispatched to provide care for the birds. Long-term support helped see the releasable birds through rehabilitation. Kenya - WPT co-sponsored a workshop of agencies to harmonize communication and collaboration especially concerning procedures to help Grey Parrots impounded in transit. The Trust also provided support for the construction of a rehabilitation aviary for confiscated Greys. India - WPT supported education, awareness and wildlife confiscation efforts by the Visakha Society for Protection and Care of Animals. The Trust also provided guidance and financial support for an effort to rescue 74 unfledged Alexandrine Parakeets (Psittacula eupatria). Nepal - WPT and Bird Conservation Nepal studied the country’s wild bird trade and determined that increasing use of birds by people for pets, meat and religious purposes are the main factors fuelling the trade in Nepal. A regional working group on the wild bird trade was proposed and supported by the government. Indonesia - WPT assisted with the release of extremely rare Mitchell’s Lorikeets (Trichoglossus haematodus mitchellii) on the island of Nusa Penida. This species is reduced to a small handful of remaining birds due to trade. Argentina and Chile - WPT funded the printing of informational booklets for school aged children that profile the Patagonian Conure (Cyanoliseus patagonus), a local species frequently found in trade. The Trust is also funding the protection of a colony of the rare Chilean subspecies, which has been under severe poaching pressure in recent years. Guatemala - WPT supported the Wildlife Rescue and Conservation Association (ARCAS) to return 80 birds (Ara and Aratinga parrots) to the Rio Azul-Mirador National Park in northern Guatemala. Brazil - WPT worked with partner Associação Bichos da Mata (ABM) to release 47 birds (Amazona and Ara macaws) to the Pantanal in Brazil. WPT participated in their release of almost 100 Blue-fronted Amazon Parrots (Amazona aestiva), provided 12 radio collars and are partnering to monitor birds post-release. The Trust co-hosted a workshop with IBAMA São Paulo and ABM for those involved in rehabilitating and releasing parrots. The Trust also provided emergency assistance for 300 Amazon parrot nestlings seized from trappers. Mexico - WPT provided technical help and bands to Conrehabit in Mazatlan Mexico for the rehabilitation and release of over 250 Orange-fronted Conures (Aratinga canicularis) confiscated from poachers as chicks. Belize - Working with Belize Bird Rescue, WPT provided support for the rehabilitation and release of confiscated Amazon parrots. The Trust also participated in releases and provided bands and guidance as needed. Honduras: WPT met with wildlife trade enforcement officers in Honduras about heavy cross-border wildlife trafficking with Nicaragua. Near the city of Copan a new project was initiated to rehabilitate and release Scarlet Macaws (Ara macao) into a UNESCO National Heritage Park and Archaeological site.